While working at a hair salon in Santa Monica, California, Ryan Blake played a role. Blake recalls acting like a “stereotypical gay dude” at the business, not a 22-year-old gender nonbinary individual who doesn’t necessarily identify as either male or female, which can find expression in pronoun usage or dress. “I just wasn’t comfortable even reaching that conversation ’cause I knew it wouldn’t go well,” said Blake, who felt coming out as gender nonbinary could mean being treated differently, or worse, losing their job. So Blake never did, and that’s why the stylist could be found recently at the first job fair for transgender, gender nonbinary and nonconforming individuals sponsored by the St. John’s Well Child and Family Center in South Los Angeles. The event at Los Angeles Trade-Tech College, which was not unprecedented, drew more than 700 job seekers from a community that often faces employment discrimination for its diverse gender identity or expression. But on this day, more than 70 employers were assembled, including corporate giants such as Hilton, Sony, Starbucks and Viacom. And in seeking qualified job candidates for positions including sales, marketing and entry-level executive assistants, the companies were taking a definite stance in supporting a community whose rights have been debated — both politically and culturally — for well over a decade. During the Obama administration, there were advances in transgender rights, such as the historic lifting of a ban on military service. But under President Trump’s conservative agenda there has been a rollback, including a U.S. Supreme Court decision upholding Trump’s decision to reinstate the military ban — and the revocation of federal policy that allows public school students to choose the bathroom consistent with their own gender identity. Rex Wilde, program director at Trans Can Work, an L.A.-area advocacy group and a job-fair partner that offers companies gender inclusivity training, said employers are taking the initiative in creating an inclusive workplace. “It’s no longer an issue of if you have a transgender employee, it’s a matter of when you have a transgender employee,” said Wilde, who uses “they” and “them” pronouns too. The group, which has trained some 300 businesses since its inception three years ago, has seen the number of companies and businesses requesting training double over the last year, at least partially due to state law. Senate Bill 396, a bill approved in 2017, requires California employers with 50 or more workers to hold training on harassment based on gender identity, gender expression and sexual orientation. And starting this year, SB 179, also known as the Gender Recognition Act, allows Californians to choose the gender-neutral option of “nonbinary” on their driver’s license. It also makes it easier for them to change official documents to reflect their gender. But while California is considered one of the most progressive states in offering protections for gay, bisexual and transgender employees, trans employees still suffer discrimination. A study of data from 2015 to 2017 by the Williams Institute at the UCLA School of Law and the California Health Interview Survey found there are an estimated 80,000 transgender Californians in the workforce. But about 15% of 3,453 California transgender residents surveyed in 2015 reported being unemployed, about three times higher than the state unemployment rate, according to the National Center for Transgender Equality. About a third of them reported living in poverty. In Washington state, 1,667 transgender residents responded to the survey; 14% reported being unemployed and 28% reported living in poverty. People in the transgender, gender nonbinary and nonconforming community also face barriers staying employed. Sixteen percent of Washington respondents said they lost a job because of their gender identity or expression, and 28% reported being fired, denied a promotion, or not being hired for a job they applied for because of their gender identity or expression, the survey found. One reason is that members of the community don’t enjoy the same rights that women, minorities and people with disabilities have long fought for: Currently, there is no federal law that prohibits employment discrimination on the basis of gender identity or expression. That may change if the U.S. Supreme Court decides to hear the case of Aimee Stephens, a transgender woman who reportedly was fired from her job after coming out to her boss — and rules on whether transgender employees are protected under the Civil Rights Act of 1964. But companies that count themselves as progressive aren’t waiting on definitive legal opinions. In recent years, more companies are adhering to nondiscrimination policies, gender transition guidelines and adding access to inclusive health care, according to the Human Rights Campaign Foundation, which releases an annual report rating workplaces on LGBTQ equality rights. In its 2019 report, it designated more than 570 businesses as being a “Best Place to Work for LGBTQ Equality,” compared with 13 companies in 2002. The report also found 853 employers are now offering transgender-inclusive health benefits. That includes 62% of the Fortune 500-ranked businesses. Among the top-rated companies by the foundation is Starbucks, which broadened its health care coverage in 2012 to include gender reassignment surgery, said Bailey Adkins, a spokesperson for the coffee chain. The company also covers procedures for transgender partners of employees, including surgery for breast reduction or augmentation, facial feminization and hair transplants. “We think that level of accessibility to health care is important and we are constantly evaluating and innovating our benefits to be more valuable for our partners,” Adkins said. Stephen Divenere, a director of talent acquisition at Viacom, said the St. John’s event was the third time the company attended a job fair for the transgender community. After the media company attended a job fair held by the Los Angeles LGBT Center, it invited people from the center to speak to the company’s hiring team about the needs of the community. 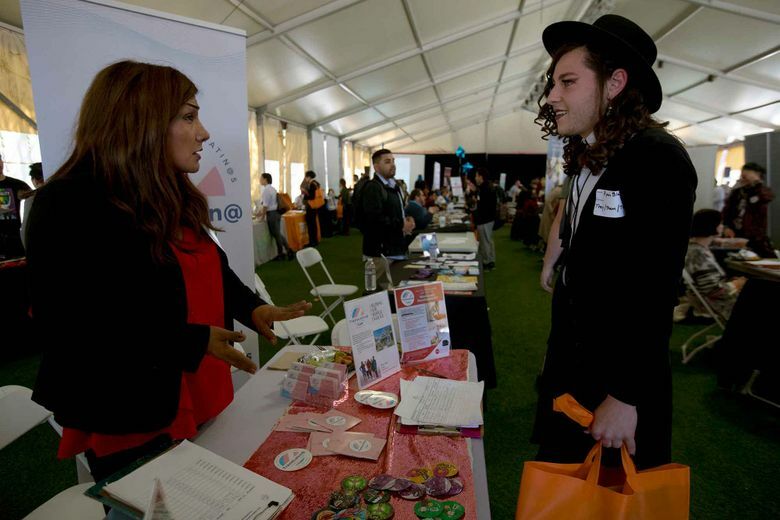 The Los Angeles LGBT Center has hosted a job fair for the transgender and nonconforming community for the last 11 years, said Eden Anaï-Luna, manager of the Transgender Economic Empowerment Project at the center. In recent years, more corporations have reached out and participated in the job fairs, said Luna, who also uses “they” and “them” pronouns. The empowerment project helps prepare and match transgender job seekers with potential employers, who also receive training, Luna said. The number of small businesses and companies requesting training has increased by about 10 to 20 each year for the last 10 years, to the point that 482 businesses have been trained. “Now companies are having questions like, ‘Well, what does professional attire look like for someone who’s nonbinary?’” Luna said. Wendy Musell, president of the California Employment Lawyers Assn., said she thinks the companies are having the same reaction as they did when they began to embrace the gay, lesbian and bisexual communities. “I think these companies are understanding that there’s some incredibly talented applicants out there that are untapped,” Musell said, “and by demonstrating that it’s a safe and welcoming environment, they not only get excellent employees, but they also get brand loyalty from the LGBT community” from both employees and customers. Something else that may be driving the outreach is a need to expand the pool of prospective employees, given record low unemployment, which dropped to 3.8% nationwide in March nationwide and to 4.2% statewide in February. However, Musell said that companies would seek to expand their hiring to transgender employees only if they had already made a commitment to be more inclusive. Michael Prejean and Evan Rego, who are both transgender men, found support in the Bay Area-based coffee shop chain, Peet’s Coffee, which recruited at the job fair. Prejean, who is also a store manager, decided to transition after working at Peet’s for eight months. At first, he said, he was afraid how others would respond, as well as the possibility of being rejected. But Prejean said his experience was smooth, down to the small things — such as getting an email with his new name, seeing “Michael” on the weekly schedule — and to the big things, such as the company health insurance covering his gender reassignment surgery costs. He had to cover copay costs only. “I couldn’t have asked for more,” said Prejean, who has been with the company for four years. One of the balancing acts transgender people face in applying for jobs is figuring out when to “out” themselves, says Taj Jackson, a black trans woman at the job fair looking for a job that offered more stability than her current one at a bridal store. Indeed, horror stories still abound. Teyana Garcon, a transgender woman from Los Angeles, was at the job fair after looking for work for almost a year. Garcon said she was hired for a job as a parking attendant, only to find out right before starting that she was let go. Garcon attributed it to the employer finding out she was transgender. “A lot of people are just uncomfortable with what they don’t understand,” she said. But Garcon, a student at Santa Monica College studying music, said she attended the job fair with a positive mindset. She had just finished updating her official documents with her new name, and she was determined to find a job with an employer who accepted her. “I want to be hired so bad,” she said.